There are many figures and sculptures of mothers and daughters, but it seems there aren’t as many of fathers and sons. 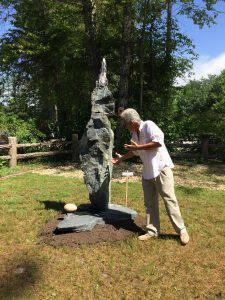 Sculptor Carl Peverall dives deep into explaining his magnificent piece titled just that, ‘Father and Son’. 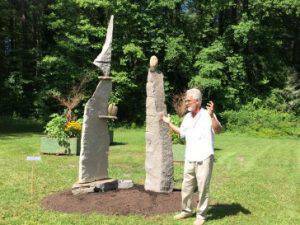 Carl’s son, Ethan Peverall, also happens to be his partner in sculpture design, creation and installation. Ethan is in the video standing to the right! Join us in person for the opportunity to ask questions and meet the garden experts at any one of our Garden Talk Salons. Want more? Visit our extensive collection of videos for you to enjoy from Dovecote Porch and Gardens by clicking here. 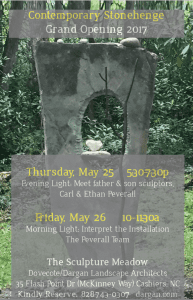 Meet sculptor and speaker, Carl Peverall, on Friday, June 27th at 10 am. 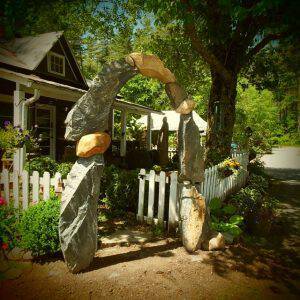 What does it take to create a fine sculpture from raw materials like stone, pebbles, metal? 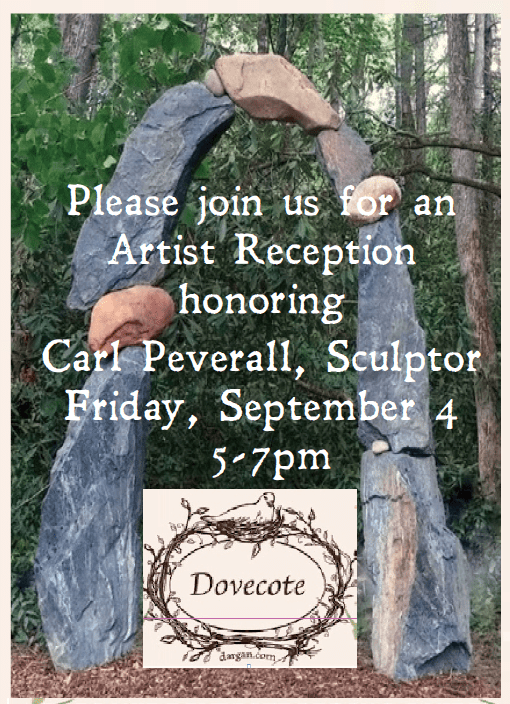 Join us as we unveil 3 new works of art by Carl Peverall. 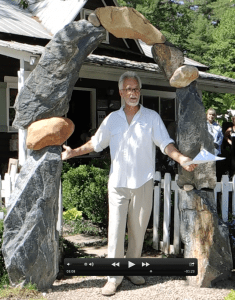 The event is part of Dovecote’s Grand Opening weekend. LOCATION: Dovecote Porch & Gardens McKinney Way (35 Flash Point Drive, Cashiers, NC 28717) off Cashiers School Road next to Cornucopia. Please follow the signs to park. 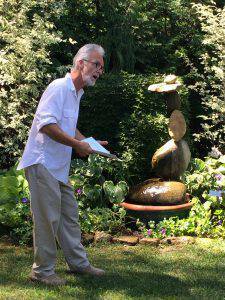 If you haven’t met Carl Peverall, you are in for a treat! 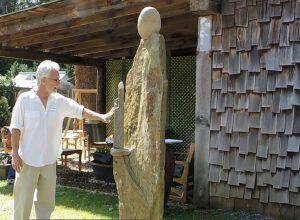 During my life as an artist, there has been a balance of time devoted to working three and two dimensionally. Over the years, these two approaches have evolved into complimentary endeavors that are mutually supportive energetically. 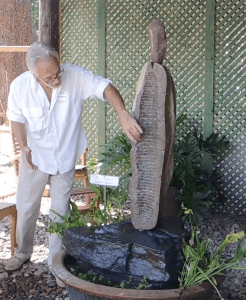 “Having first trained in ceramics, I began and still use clay, fired in the raku technique, as a medium to express a very personal language that draws upon eclectic influences like quantum physics, the architecture of Antoni Gaudi and the sublime, elemental sculpture of Isamu Noguchi. My intent in these works is to follow my own creative muse without inhibition and make pieces that represent the unique character and awareness of our time. “Contrasting this labor intensive studio work, I continue to be seduced by a love for the landscape which I consummate by painting on location, primarily in pastel. In so doing, there is opportunity to recharge by stepping outside the studio and my “self” through a direct connection with nature. I intend for my paintings to have a fresh, spontaneous quality while still honoring the character of the place and moment of their origin. 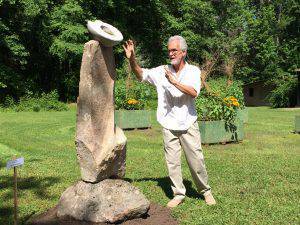 “Most recently, I have begun to work not just “from” nature but “with” nature by making stone sculpture. 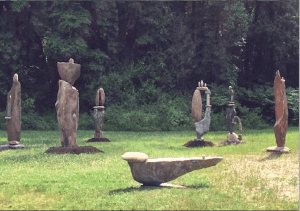 These new works materialize dreams that began over twenty years ago while living in New York where I spent many hours hiking through Rockland County by the Hudson River, visiting Storm King and Isamu Noguchi’s studio and museum. 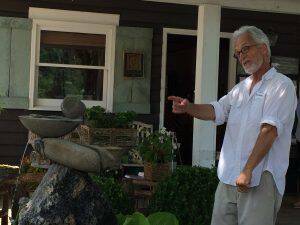 For the knowledge and inspiration to take this step forward, I owe much gratitude to sculptor Chris Booth of New Zealand, his remarkable work and friendship. For more information & parking map here.